What the imam and students didn’t know was that members of the New York Police Department Intelligence Division were spying on them and recording their names and actions in secret reports forwarded to Police Commissioner Raymond Kelly. None of these people had done anything wrong or even suspect: they were simply Muslims practicing their constitutionally protected freedoms of religious belief and speech. But for today’s police, that was enough to earn them a place in the department’s secret counterterrorism database. As the Associated Press revealed in a Pulitzer Prize–winning series of exposés, the New York Police Department has been engaged in a vast domestic spying operation targeting Muslims for surveillance, mapping and infiltration. Stretching from the heart of New York City to the border of Canada—by way of Connecticut, New Jersey and Long Island—the program is as massive in scope as it is in ambition. In the name of total security, the NYPD treated basic acts of daily living as potential crimes, disregarding privacy and the freedom of speech and religion. Traditional barriers between foreign and domestic spying were partially collapsed. And the “war on terror” took lessons from the war on crime. In the process, the NYPD created perhaps the largest spying program by a local law enforcement agency on record—a sprawling effort to map entire communities that emerged from the toxic convergence of the permanent state of emergency gripping our society since 9/11 with the NYPD’s historic propensities. The details of the operation are stunning. From an office at the edge of Brooklyn, a secret Demographics Unit dispatched “mosque crawlers” (informants) and “rakers” (undercover police officers) to engage in the “human mapping” of mosques, cafes, bookstores and other hangouts within “communities of interest.” These communities consisted—or still consist, as officials have not denied that the program is ongoing—of people with roots in twenty-eight predominantly Muslim countries (think Syria, Egypt, Iran and so on) as well as those designated “American Black Muslim.” Imams—including those reputed to be close to law enforcement—came in for special attention, but the truth is that no one was exempt. Cabdrivers, food-cart vendors and college students were all fair game, and not a single detail of their lives seemed too small to record. Of course, the leaked NYPD files paint only a partial portrait. Guessing at the surveillance program’s full contours requires relying on anecdotal evidence gleaned from the accounts of targeted people. Since 2009 I have supervised the Creating Law Enforcement Accountability & Responsibility (CLEAR) project at the CUNY School of Law, and during this time my students, colleagues and I have represented many members of New York’s Muslim communities whom the NYPD Intelligence Division approached for gratuitous questioning unrelated to any crime. Our clients were interrogated about articles posted online and downloaded content; they were even asked their opinions regarding the Arab Spring. In the majority of our cases, as soon as CLEAR intervened with the authorities, the attempts at questioning ceased, further suggesting that the NYPD was on a massive fishing expedition, unmoored from any nexus of concrete criminal activity. To understand how the NYPD came to create this brave new police order, it’s necessary to untangle some of the many influences that went into creating it—beginning with Ray Kelly’s dream of a Langley on the Hudson. Throughout much of the twentieth century, the NYPD ran aggressive spy operations. Anarchists, communists, labor organizers, civil rights organizations and various ethnic groups were all monitored by a succession of “Red Squads.” But in the decades immediately before 9/11, the department had largely retreated from the spy business. So when Kelly took office several months after the attacks, he saw one of his first tasks as developing a spy program that would rival the US government’s efforts. “The city could not simply defer the responsibility of counterterrorism to the federal government,” he explained in a recent speech. But first Cohen had to get rid of a longstanding consent decree that had restrained the NYPD’s spying efforts for nearly twenty years. In 1971 a coalition of activist groups had filed a federal lawsuit, Handschu v. Special Services Division, challenging the NYPD’s overzealous surveillance of political activism and the compilation of police files on outspoken citizens with radical (often left-wing) beliefs. The resulting Handschu Guidelines, which were formalized in 1985, limited the NYPD’s ability to spy on activists in the absence of specific information that criminal conduct was afoot. These strictures were widely seen as important bulwarks against improper police interference with political activism. A day after the first anniversary of the 9/11 attacks, Cohen submitted a sworn declaration to the federal court in New York that oversaw implementation of the guidelines, stating that “the counterproductive restrictions imposed on the NYPD by the Handschu Guidelines in this changed world hamper our efforts every day,” making it “virtually impossible to detect plans for attack” and placing “this City, our nation and its people at heightened and unjustifiable risk.” The court agreed to pare down the restrictions, most significantly eliminating the criminal activity requirement. With the Handschu agreement out of the way, Cohen went about creating an intelligence division modeled on his CIA experience. He recruited another veteran spook, Larry Sanchez, who helped design the sprawling NYPD surveillance program while still on the CIA’s payroll. Since then, at least one NYPD detective has taken the “tradecraft” course offered to all clandestine agents training at the Farm, the CIA’s spy academy, while a seasoned CIA operative was embedded with the NYPD. This intimacy between a local police force and America’s principal overseas intelligence agency is unprecedented and alarming. Because of past excesses, the CIA is generally precluded from domestic spying by presidential order and can only provide expert personnel or assistance to support local law enforcement agencies with the approval of its own top lawyer. No such authorization was granted for its operatives’ work with the NYPD, and the leaked documents indicated that CIA elements may have ignored restrictions on the domestic collection of intelligence. The resulting NYPD spying venture had a distinctly hybrid quality, applying methods intended for overseas use domestically. It also harked back to the counterinsurgency strategies deployed in the war zones of Afghanistan and Iraq, where the US military canvasses residents’ opinions while collecting photographs and fingerprints, under the rubric of “human terrain mapping.” No less disturbing: according to a former police official quoted by the Associated Press, the NYPD approach was partly modeled on how Israeli authorities operate in the Occupied Palestinian Territories, casting the NYPD in the role of brutal occupying force—and the areas where American Muslims live as occupied foreign territory. With the applicable legal structures weakened and the CIA-inspired infrastructure in place, the program’s founders needed firm ideological underpinnings, a set of guiding principles. They found these in “radicalization theory,” a doctrine popular in federal policy-making circles despite considerable empirical flaws. Radicalization theory draws much of its vigor from the collective trauma of 9/11, which made plausible the notion of a constant, omnipresent, almost supernatural threat. In turn, this made mythical prospects of total security particularly appealing to officials and the public alike. The distortion of policy-making through a total security prism—a phenomenon I call “9/11 warping”—can be observed both in the altered functioning of already existing systems (such as the imposition of cruel pretrial and post-conviction conditions of confinement in terrorism cases) and in the creation of new systems (such as military commissions, the prisons at Guantánamo Bay and Bagram, and the infamous CIA black sites). Another major expression of 9/11 warping can be found in the national shift toward a sharply preventive law enforcement paradigm, supplanting the conventional, mostly retrospective model. Cohen had declared to the court that “in the case of terrorism, to wait for an indication of crime before investigating is to wait far too long.” In its quest for precursor conduct and predictive models, the NYPD naturally embraced radicalization theory, even issuing a report, “Radicalization in the West,” in 2007 that posited the existence of a conveyor belt relationship between increased religiosity and violent action. The NYPD’s resulting tarot card police strategy sought out the signs and symbols of radicalization with the intention of taking “pre-emptive” measures to prevent future crimes. That this “preventive” policing doctrine became popular at the same time that George W. Bush’s “pre-emptive war” doctrine dominated the foreign policy conversations hardly seems accidental. Civic groups such as the Muslim American Civil Liberties Coalition roundly condemned the NYPD’s approach. Experts pointed out that the general theory lacked both empirical and social science support, while the NYPD report relied on news articles instead of scholarship or representative data and favored sweeping generalizations that stigmatized entire communities. Indeed, major academic studies on the topic arrived at conclusions almost diametrically opposed to the NYPD’s. In “Rethinking Radicalization,” analysts at the Brennan Center for Justice pointed out that it is “simply not possible to identify ‘markers’ of radicalization…that allow early identification of would-be terrorists.” Moreover, they stressed that “the claim that religiosity is linked to a propensity for terrorism” is empirically invalid. But none of this seemed to matter to the NYPD. Bad religion though it may be, radicalization theory nonetheless provided a useful blueprint and rationale for police spying on American Muslims. For all the novelty of radicalization theory, the NYPD was in many ways primed for it. Long before the “war on terror” there was the war on crime, which reached its apogee under Mayor Rudolph Giuliani. A former prosecutor with a sheriff complex, Giuliani grew the already massive NYPD into a small army of roughly 40,000 officers. (Chicago was a distant second, with only 13,000.) Along the way, he and his police chiefs implemented a number of controversial tactics that disproportionately affected black and Latino New Yorkers and erupted in high-profile abuses, such as the torture of Abner Louima in 1997 and the killing of Amadou Diallo in 1999. Among the flagship programs of the Giuliani crime-fighting era was stop-and-frisk, a profiling model applied almost exclusively to communities of color. Generally, a police officer may stop, question and sometimes frisk a citizen if there is an articulable, reasonable suspicion of criminal activity. Since Giuliani’s time, however, the “reasonable suspicion” requirement has typically come down to ethnicity and skin color. Similarities abound between covert NYPD spying on Muslims and stop-and-frisk. Just as Muslim mapping stems from roots in radicalization theory, the stop-and-frisk program grew out of the “broken windows” theory—the idea that constant policing of low-level disorder deters serious criminal activity. And like radicalization theory, “broken windows” has been empirically challenged by social scientists and other experts, who have faulted its champions for mistaking a correlation between disorder and crime for a causal relationship. As applied, both theories result in the discriminatory over-policing of minority communities. And despite their evident deficiencies, both theories have flourished under Kelly, who significantly ramped up the stop-and-frisk regime. Thanks to a lawsuit challenging stop-and-frisk, we now know that NYPD officers conducted 2.8 million street stops between 2004 and 2009. In 2011 alone, the number reached 684,000, and in the first three months of 2012, police stopped 11 percent more people than in the previous year’s corresponding trimester. Blacks and Latinos represented 87 percent of those stopped in 2011, though close to 90 percent of these stops resulted in no arrest or summons whatsoever. Unusual though they may be for local police, the NYPD’s tactics are not unique. The majority of our clients at CLEAR seek legal representation in connection with questioning and surveillance by the Federal Bureau of Investigation. Despite White House statements that domestic counterterrorism policy is premised on empowering local partners, our clients typically feel neither empowered nor treated as partners in these interactions. Whether they find themselves in the cross-hairs of the NYPD or the FBI, American Muslims are trapped in an inescapable, reductive binary: they are potential informants or possible terrorists. Either way they are targets, be it for cultivation or surveillance. For clients of CLEAR caught in the NYPD’s intelligence dragnet, as well as Muslim communities more broadly, the effects have been devastating. 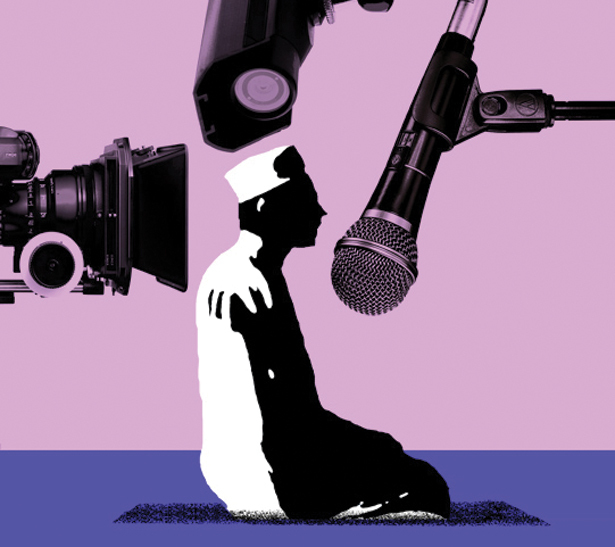 Imams are reluctant to counsel congregants, fearing they may be informants; community members’ ties to local police precincts are vitiated, undermining communication on matters of daily concern like street crime; parents tell their children not to be active in Muslim Student Associations to avoid police monitoring; and fear and paranoia deter people in affected communities from discussing current events. Repeated harassment by Intelligence Division detectives, compounded by the confirmation of pervasive NYPD surveillance of entire communities, even led one client recently to consider returning with his family to their country of origin or relocating to Canada. The NYPD spying program sends an unambiguous message to American Muslims that they are potentially subject to secret government surveillance at any time. It validates discrimination in the public eye and as a policy option, setting the stage for hate crimes and paving the path to a proliferation of copy-cat approaches by other police departments nationwide. The expansion of such methods to other demographics is not only assured but well under way, with leaked documents confirming NYPD spying on progressive and antiwar groups. For these reasons, the excesses of the NYPD must be checked. Its prestige and influence are such that its methods—and New Yorkers’ response to them—will be tracked and emulated elsewhere. Restoring and strengthening the original Handschu Guidelines governing NYPD monitoring of political activity, including the criminal activity requirement, would be an important step. Another would be challenging the surveillance program in court, which is already in progress. But litigation is slow and laborious, and most effective as part of a broader social movement calling for change. In New York City, efforts are under way to institute reliable oversight structures and promote legislation that would end stop-and-frisk and surveillance abuses. A broad coalition of organizations, including the Communities United for Police Reform campaign, is pressing for the appointment of an inspector general to oversee NYPD policies as well as for the passage of a municipal law that would clearly declare religious and racial profiling unlawful. The NYPD’s wager is that American Muslims are incapable of effective civic mobilization and that few other Americans will care about their plight. Therein lies the silver lining. By stirring up previously dormant or politically disenfranchised communities, the confirmation of NYPD spying has spurred the creation of coalitions that transcend ethnic or religious differences. Together, these New Yorkers can not only make Muslim mapping and other expressions of profiling unlawful—they can make them politically untenable, too. Ramzi KassemRamzi Kassem, a professor of law at the City University of New York, also supervises the Creating Law Enforcement Accountability & Responsibility (CLEAR) project, which works to meet the legal needs of Muslim, Arab, South Asian and other communities in New York City that are particularly affected by counterterrorism policies and practices.